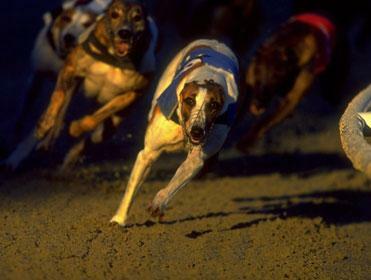 Sky's greyhound offering tonight comes from Hall Green with the highlight for once not the feature race, the Prestige Stakes, but the rollover Jackpot which is forecast to reach £500,000. The fact that the jackpot - on which we will be concentrating here - has rolled over more than once is a reminder that Open races on Sky nights regularly throw up shock results, and that's well worth bearing in mind when building a perm at Hall Green in particular as anyone familiar with the track will understand. In all three Prestige heats, dogs unfamiliar with the track ran very wide at the sharply unique bends and if there is one track at which to side with the locals, even in the face of an apparently stiff task, it is Hall Green. The first leg of the Jackpot at 19.43 is a maiden Open and it's a tricky start to say the least. Top Belle Vue grader Ballymac Chas in T2 has the best early pace but she lacks a look round here and is opposed for that reason. Wide-running Ballyhoe Code (T3) arguably has the best form but has yet to achieve much in four trials or races here and lacks experience from a draw near the inside. Top local Coolcroo Tiger (T4) tends to be slowly away, which may be no bad thing in the circumstances given the potential make up here, and she makes the shortlist along with trackmate Tyrur Susan in T5. We'll also take T1 local River Ali, who has a bit to find on the clock but breaks smartly and looks set for a clean run round the inside, to get us through the first leg. Multiple Open Race winner Ilewin Allot, trained by champion trainer Mark Wallis and drawn in T1, will be popular in the second leg at 19.59, a sprint over 285m, but he's done virtually all his winning over standard trips and comes here without a look round so gets the boot, as does Cape Impact (T2) who is seldom well away and fared poorly on his only previous start here. T3 Mister Hondo is a must-include selection, as he won a heat of the BAGS Sprint championship here in November in a decent time, has since gone better in a trial here last week and is well housed in the white. Millwards Katy is interesting finally dropped in trip after showing bags of early pace at Romford and she didn't fare badly in a trial here last week. Top local Kavarna in T5 has bundles of early pace too and could well get her own way on the outside with T6 Goes Hot 6 set for a potentially very wide run at the very tricky first bend on his first ever look round. Leg 3 at 20.16 features Blonde Razor, who has a clear edge on class, but we're happy to oppose him back in trip. Second in the 2014 Prestige, Blonde Razor was impressive in the first round of the Coronation Cup when pinging the lids but was eliminated after a slow start in the second round and has questions to answer after another lacklustre slow-starting display last time. With possible short-runner Fred The Pilot (T5) likely to need the lead and uncertain to get it, and T6 Sidarian Blitz set for a very wide course judged on his trial and first look round here last week, it seems the percentage call to concentrate on the inside traps. T1 Whittle Eagle and T2 Express Master both won heats of the BAGS track championship here in November and a repeat of either of those performances may well be good enough. The best marathon dog in the country, Burgess Borna, runs from Trap 3 in the fourth leg (20.33). Knocked out of the Prestige here last year from a bad draw in T6, her form has moved to a different level since being given an extreme test of stamina but she won over this sort of trip at Yarmouth in December and recorded a decent time for the type of dog she is when second in a trial here last week over an inadequate 480m. She'll be staying on strongly and should make the frame. T1 Black Francis has really found his niche since being moved up to staying trips, has fair early pace for a stayer, so should be able to outgun local hope Builders Fantasy to the first bend, but he lacks a look round and he has only won once from four goes at a new venue without having first had a trial. Kinsley raider Nans Speedy is likewise 0-3 at venues racing for the first time without having had a trial, so T6 Kakantu is our other selection. He narrowly missed out on making the Coronation Cup final when one of our ante-post picks at 33-1 but he made amends when winning an Open shortly after, has tremendous early speed and recorded a decent time in a 480m trial here last week. One dog stands out in the penultimate leg at 20.51, another maiden Open over the standard trip, Droopys Gooch in T4. Droopys Gooch has won four of his last six A1s here and also landed a heat of the BAGS track championship. He has three slower starters (including two with minimal track knowledge) drawn inside him and ought to be able to dominate from halfway. With puppy Jayceebee very inconsistent out of the cans in Trap5 and probably not good enough anyway, and T6 Carlow Bolt classy but lacking a look round, locally trained T1 Sylviasmamasaid, a regular winner in A1 grade here, could be the one for the forecast but we will stick with T4. The final of the Prestige and last leg of the Jackpot at 21.08 is between T1 Billy's Bullet and T2 Wiki Waki Woo according to the market. Billy's Bullet won his heat well from Jaytee Osprey after something of a charmed run through after a slow start. He's better drawn on the rail today, but there's probably not much improvement if any on that time, whereas locally-trained Wiki Waki Woo was unusually slowly away in his heat yet still managed to post a winning time right up there with his five-length defeat of another heat winner Supreme Turbo in an Open race here last month. He's right at the top of his game at the minute. If there is a runner that is overpriced, however, it is Dinzeo, who was unfairly called some unflattering names after his short-head defeat by Supreme Turbo in his heat. In what was the fastest run of the heats in the early stages, Dinzeo broke level with Supreme Turbo but found himself adrift after catching that rival's heels before making up more than five lengths going down the back straight. The exertions of making up so much ground so quickly took their toll and he was done on the nod, but he's more than capable of winning this at a decent price if things drop right.